“These new, platinum-rich polymers hold promise for white organic light-emitting diodes and new kinds of more efficient solar cells,” says University of Utah physicist Z. Valy Vardeny, who led a study of the polymers published online Friday, Sept. 13 in the journal Scientific Reports. Certain existing white light bulbs use LEDs, or light-emitting diodes, and some phone displays use organic LEDs, or OLEDs. Neither are truly white LEDs, but instead use LEDs made of different materials that each emit a different color, then combine or convert those colors to create white light, Vardeny says. In the new study, Vardeny and colleagues report how they inserted platinum metal atoms at different intervals along a chain-like organic polymer, and thus were able to adjust or tune the colors emitted. That is a step toward a truly white OLED generated by multiple colors from a single polymer. In the new study, the researchers made the new platinum-rich polymers and then used various optical methods to characterize their properties and show how they light up when stimulated by light. The polymers in the new study aren’t quite OLEDs because they emit light when stimulated by other light. An OLED is a polymer that emits light when stimulated by electrical current. “We haven’t yet fabricated an OLED with it,” Vardeny says. “The paper shows we get multiple colors simultaneously from one polymer,” making it possible to develop an OLED in which single pixels emit white light. 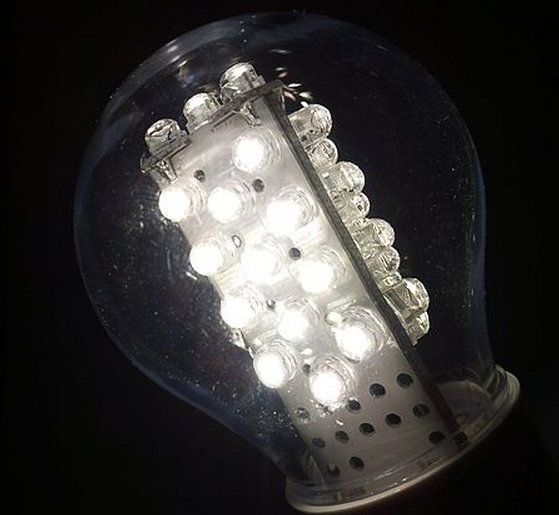 Vardeny predicts about one year until design of a “platinum-rich pi-conjugated polymer” that is tuned to emit white light when stimulated by light, and about two years until development of true white organic LEDs. “The whole project is supported by the U.S. Department of Energy for replacing white light from regular [incandescent] bulbs,” he says. The University of Utah conducted the research with the department’s Los Alamos National Laboratory. Additional funding came from the National Science Foundation’s Materials Research Science and Engineering Center program at the University of Utah, the National Natural Science Foundation of China, and China’s Fundamental Research Funds for the Central Universities. Inorganic semiconductors were used to generate colors in the original LEDs, introduced in the 1960s. Organic LEDs, or OLEDs, generate light with organic polymers which are “plastic” semiconductors and are used in many of the latest cell phones, digital camera displays and big-screen televisions. Existing white LEDs are not truly white. White results from combining colors of the entire spectrum, but light from blue, green and red LEDs can be combined to create white light, as is the case with many cell phone displays. Other “white” LEDs use blue LEDs, “down-convert” some of the blue to yellow, and then mix the blue and yellow to produce light that appears white. The new platinum-doped polymers hold promise for making white OLEDs, but can convert more energy to light than other OLEDs now under development, Vardeny says. That is because the addition of platinum to the polymer makes accessible more energy stored within the polymer molecules. A “singlet” state that can be stimulated by light or electricity to emit higher energy, fluorescent blue light. Until now, OLEDs derived their light only from this state, allowing them to convert only 25 percent of energy into light – better than incandescent bulbs but far from perfect. A normally inaccessible “triplet” state that theoretically could emit lower energy phosphorescent red light, but normally does not, leaving 75 percent of electrical energy that goes into the polymer inaccessible for conversion to light. Ideally, a new generation of white OLEDs would not only produce true white light, but also be much more energy efficient because they would use both fluorescence and phosphorescence, he adds. For the study, the researchers used two versions of the same polymer. One version, Pt-1, had a platinum atom in every unit or link in the chain-like semiconducting polymer. Pt-1 emitted violet and yellow light. The other version, Pt-3, had a platinum atom every third unit, and emitted blue and orange light. By varying the amount of platinum in the polymer, the physicists could create and adjust emissions of fluorescent and phosphorescent light, and adjust the relative intensity of one color over another. Vardeny conducted the new study with former University of Utah postdoctoral researcher Chuanxiang Sheng, now at Nanjing University of Science and Technology in China; Sergei Tretiak of Los Alamos National Laboratory; and with University of Utah graduate students Sanjeev Singh, Alessio Gambetta, Tomer Drori and Minghong Tong. The physicists hired chemist Leonard Wojcik to synthesize the platinum-rich polymers.